Videos, Recipes, Essays, Oh My! So it’s been a very busy week at work with Voracious (see my early post), Easter, and the start of Seattle’s Restaurant week! And all I could really think about is the Basque Stage even after working countless amount of hours. Look Mom!!! I did it!! 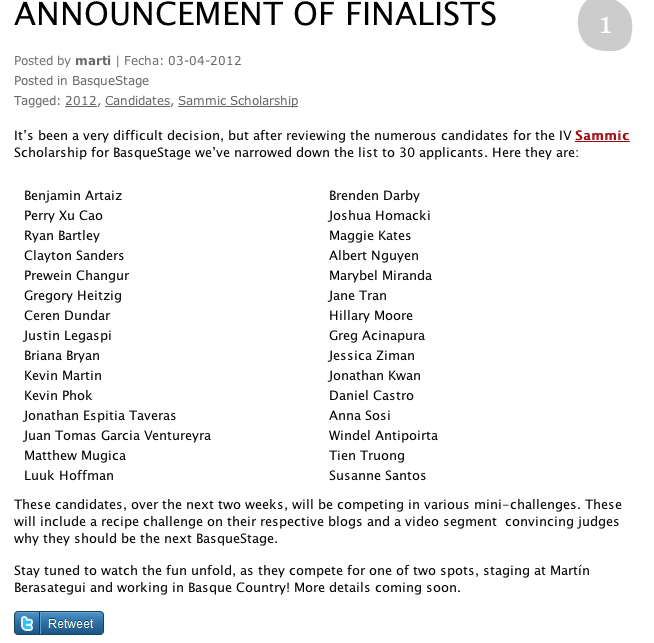 I haven’t really mentioned it to anyone yet because it’s still pretty hard for me to soak it in, but I am one of the 30 candidates to possibly be one of the 2 finalists they choose to go to Spain and Stage at Martín Berasategui, a three-star Michelin restaurant in the Basque Country. I will be posting a lot in the next couple weeks as we all have objectives that we must fill for our application for this stage. So be expecting a video that features myself, about myself, hitting the web by tomorrow! I will be have a very exciting post where I will show you one of my most favorite things to eat. And if you are lucky, maybe you’ll even get to read probably one of the most important essays I will have to write! I am so very proud to be part of this and hope all of you can see the excitement that I have for this opportunity. So please stay tuned and come see me as I climb these steps to get to Spain!